Mayor Michael A. Nutter, Chief Cultural Officer Gary Steuer and over 200 arts professionals, advocates and artists celebrated the launch of the Knight Arts Challenge Philadelphia on October 5, 2010 at a special reception at TRUST in Old City. To encourage a wide range of applicants and ideas, the challenge has just three rules: The idea must be about art, must take place in or benefit Philadelphia, and winners must find funds (within a year) to match Knight Foundation’s grant. The challenge, a project of the John S. and James L. Knight Foundation to fund the best ideas for the Philadelphia arts, will offer $9 million in funding over three years. Applications – open to anyone in the region – will be accepted through Oct. 31 at KnightArts.org. 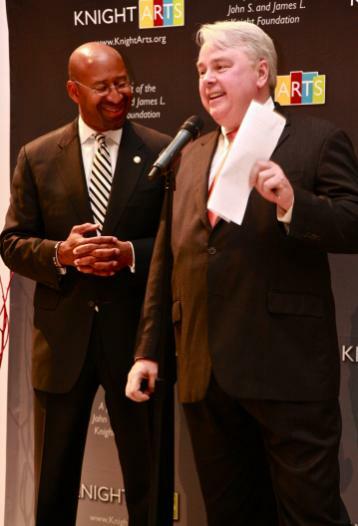 For more on Knight Foundation’s arts initiative, visit KnightArts.org. Philadelphians can also learn more and share ideas with the community on the Knight Arts Challenge Philadelphia Facebook page here.